Atlantyca Entertainment’s Geronimo Stilton classic is getting a featured attraction area at Leolandia, Italy’s leading theme park dedicated to families and children, based outside of Milan! Set to open this June 2017, the attraction will be housed in structure located centrally and feature a new pirate themed adventure for Geronimo Stilton at the park, the famed reporter mouse will be enthusiastically meeting his many young fans and their families. Leolandia is Italy’s premiere park devoted to families with young children. The park marries amusement, edutainment and nature, and can be found only a few minutes from Milan, with 6 themed areas and over 40 attractions and entertainment shows. Geronimo Stilton joins a line-up of popular themed attractions such as Peppa Pig World, Thomas the Tank Engine and Masha and the Bear. “This is such an extraordinary opportunity for us,” noted Rachele Geraci, Atlantyca Entertainment’s Live Events Manager. “We are so excited to be part of the Leolandia’s great family and to be part of such an amazing and wonderful children’s destination. 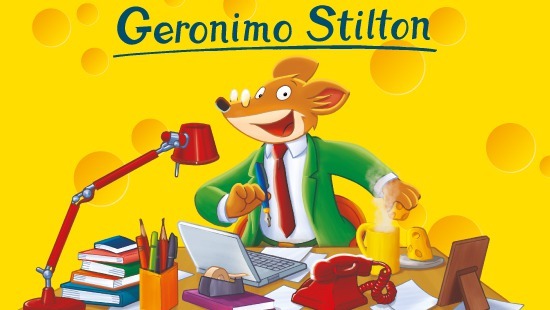 Geronimo Stilton is all about children, family and having a good time with adventures, the joy of bringing fun and excitement to kids is what he personifies.” “Today Leolandia confirms its Made in Italy excellence status, as well as a reference point among European theme parks. – states David Tommaso, Leolandia’s new Marketing and Sales Director – The strong visits growth over the last three years, which is even more considerable in these first months of 2017, has led Leolandia to become the first theme park for families in Italy, with 1 million visitors expected throughout the season. Since 2014, Leolandia has been hosting the most popular cartoon characters, developing dedicated areas and immersive storytelling that recreate their worlds. Leolandia has become the park where children’s dreams come to life: we are really glad of the creative development at Leolandia of Geronimo Stilton, who perfectly meets the project vision of the park and completes our offer by targeting children in a higher age group.” Leolandia will support the Geronimo Stilton attraction launch with a dedicated marketing and advertising campaign.